*If you can't find rose syrup (at a gourmet grocery), you can make it with 1 teaspoon of rose water plus 3 tablespoons of honey and 1 tablespoon of water. Rose water is easier to find than rose syrup. Cream butter, sugar, mace, 2 tablespoons of the syrup, and cream until fluffy. Beat in egg, one at a time. Add flour one cup at a time until just mixed. Preheat oven to 350º F. Roll out dough to about 1/4 of an inch. 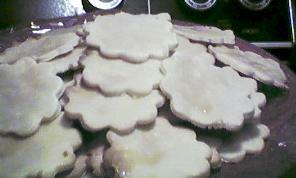 Press out cookies in flower shapes onto non-stick baking sheet, and bake for ten minutes. 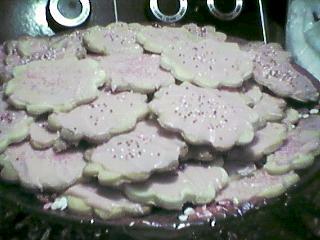 Brush rose syrup onto hot cookies and sprinkle with rose petals if desired. Note: This recipe is actually from the year 1610. I had to add lots of flour to this recipe to make the dough handleable. You should add flour until the dough is no longer sticky and can conceivably be rolled out and cut. The cookies are good and sweet plain, but can be complemented with modern icing and decorations! Try a sweet strawberry icing. Source: Francine Segan, Shakespeare's Kitchen. Adapted for that publication by the author from original source: Sarah Longe's Mistress Sarah Longe Her Receipt Booke, 1610.